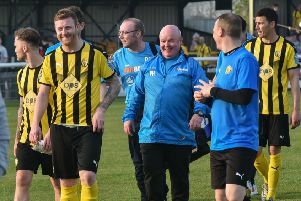 Leamington boss Paul Holleran has mounted a strong defence of Jack Edwards after the midfielder was dismissed for two yellow-card offences in Tuesday’s 1-0 defeat at St Neots. Edwards was sent off five minutes from time in a niggly Southern Premier League clash settled by Tom Meechan’s 48th-minute strike. However, Holleran questioned the tactics and gamesmanship employed by the home side and felt Edwards was let down by the officials. “We were well aware the heating would be on in the changing room, we wouldn’t be able to open the windows, one of the toilets wouldn’t flush and they would target certain players,” said Holleran. “We knew that and we can stand on our own two feet. “When you play against a side that play the way they do, you have to be big, strong and stay in control. You also need a strong official. “I was disappointed for Jack as he was targeted from the word go. He wasn’t protected. “Two players doubled up on him and one has ended up breaking his own player’s nose. “Jack did niggle away and concede free-kicks, but the second booking was harsh. I’m not denying the challenge but it was in keeping with the nature of the game. Holleran was equally unequivocal in his backing for Joe Magunda, who saw red for violent conduct in the dying seconds. “James Mace has made a clean tackle, their player is rolling around and we’ve got sucked in. “It’s all pushing and shoving and as Joe has walked back he’s stepped on a player. “Now Joe has played for me for four seasons and I know him inside out. “He gets involved when he doesn’t need to but the one thing he wouldn’t do is stamp on a player. “I’ll defend him for that. “We got sucked into a situation we didn’t need to and lost our discipline and control - we know we have to be better than that. However, despite the two sending-offs overshadowing the defeat, Holleran said the performance was much-improved from the one which gained them all three points against Chesham on Saturday. “We were well off it Saturday. We never got going and you take the 1-0 and get the monkey off your back with a home win. That opportunity fell to loan signing Will Green, who has joined Brakes in a month-long deal from Brackley Town. Green, who is in his second spell at the club, blazed his shot over the bar when clean through but Holleran believes his pace will eventually deliver goals. “Will had better offers but he wanted to come here. “He’s an impact player with pace and he gets behind people and will be an asset to us. “We knew that when the game opened up we could get him behind St Neots in the last 15 to 20 minutes. A tightness in his calf prevented Richard Taundry from starting in midweek and he will be assessed ahead of tomorrow’s trip to Histon, while Jamie Tank is still ruled out with ligament damage. Magunda and Edwards, who can expect three- and one-match bans, respectively, will both be available for tomorrow and Tuesday’s home clash with Kettering Town.